« Be a Film Critic and Get Free Stuff! 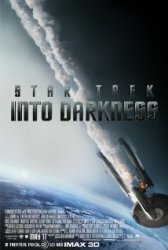 “Star Trek into Darkness” is the second movie based on the original TV series and, for those of us who grew up watching this show, brings back all our favorite characters – Captain James Kirk (Chris Pine), Spock (Zachary Quinto), Uhura (Zoe Saldana), Bones (Karl Urban), Scotty (Simon Pegg) and Sulu (John Cho.) The storyline is also reminiscent of those of the past but fleshed out with 3D, great character development, outstanding sound effects and good acting throughout. Our youth film critics were wowed by the film. Patrick N., age 13, commented that it “left me in awe and thrill.” It also brings attention to the close brotherly relationship between Captain Kirk and Spock. In the end, Patrick finds a new passion for “Star Trek” as you can see below. View Patrick’s full video review here! Satirical, emotional and epic are the only words to describe the new movie “Star Trek Into Darkness.” I got a chance to visit the Paramount Lot for an exclusive screening of this movie, which left me in awe and thrill. Although this movie is a sequel to the previous “Star Trek” series, movie goers who are not familiar with the story will understand the plot clearly. The actors portray their characters very well thanks to the director, J.J Abrams. The scenery and set for the futuristic year of 2240 are so vivid and realistic, audience members will forget they are in the year 2013. This movie is also produced for the IMAX 3D, which puts all the explosions and fight scenes in your face. The relationship of all the characters on the iconic Starship Enterprise are deep and meaningful. Captain Kirk (Chris Pine) and Spock (Zachery Quinto) develop a brotherly love through the struggles they conquer. The Villain, Khan (Benedict Cumberpatch) is a scary two-faced character that will leave the audience guessing his fate until the very end. Not only does the main star achieve his role perfectly, but the co-stars also do an superb job. The writers, Roberto Orci, Alex Kurtzman and Damon Lindelof successfully add comedy to the script bringing an emotional roller coaster to the audience. The set ranges from modern skyscrapers to futuristic spaceships. The designers portray the theme very well, using many computer generated images to create the year of 2240 in a way that make it seem so real. The 3D element is an added bonus because it brings the action up close. The beginning scene has a lot of running and fighting sequences and yet it is all filmed in such detail that the characters seem like they are going to run off screen. After watching this movie, my passion for “Star Trek” has been sparked! I rate this movie 5 out of 5 because it balances the comedy and action scenes so well. It has multiple themes taking place but the on-going theme, “the power of friendship can build you or destroy you” is present throughout. This movie contains a handful of violence but is not bloody or graphic. The action sequences, violence and realistic make-up could be scary for younger audience members so, I recommend this for ages 13 to18. This movie has sparked an interest in “Star Trek” for me and hopefully it will do the same to you. This entry was posted on Tuesday, May 21st, 2013 at 1:48 pm and is filed under Jury Updates. You can follow any responses to this entry through the RSS 2.0 feed. Both comments and pings are currently closed.